Everyone needs proper nutrition to achieve their full potential. However, many people around the world – especially children – aren’t getting the vitamins and minerals they need. This causes a wide range of health and development issues. 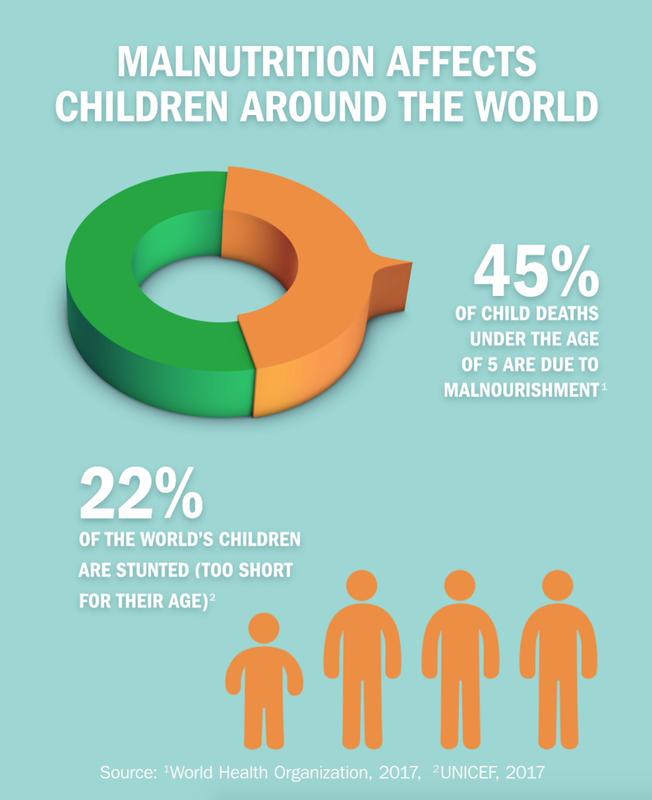 Children are most vulnerable to malnutrition. If they don’t receive essential nutrients in their first 5 years of life, brain and body development won’t happen like it should – and the opportunity for that development is lost. Seven million children under the age of 5 die each year from preventable causes. Malnutrition is the underlying cause of 45 percent of these deaths, according to the World Health Organization (WHO). Chronic malnutrition is a persistent lack of access to necessary vitamins and minerals. This condition makes children more susceptible to disease and underdevelopment of the brain and body. It also can lead to health problems later in life, including stunting, which is when children are too short for their age. Malnutrition has lasting effects. According to the Global Alliance for Improved Nutrition (GAIN) and CARE International, children deprived of adequate nutrition during the first 1,000 days of life often have stunted growth, poor cognitive development and low immunity to disease. Malnutrition affects school performance and studies have shown it often leads to earning a lower income as an adult. So here’s the good news…childhood malnutrition is completely preventable and Amway is helping address this this important issue. Backed by decades of experience in nutrition and millions of Amway Business Owners around the world, we are in the ideal position to help. Please join us and donate or participate to help more malnourished children survive, thrive and grow.